Flash back to to 2000-2001. In 2000, the Taliban government with the support of the United Nations implemented a successful drug eradication program, which was presented to the UN General Assembly on October 12, 2001, barely a week after on the onset of US-NATO invasion. Opium production had collapsed by 94 percent. The Afghan government’s drug eradication program was repealed. The 2001 war on Afghanistan served to restore as well as boost the multibillion dollar drug trade. It has also contributed to the surge in heroin addiction in the US. Opium production had declined by more than 90 per cent in 2001 as a result of the Taliban government’s drug eradication program. 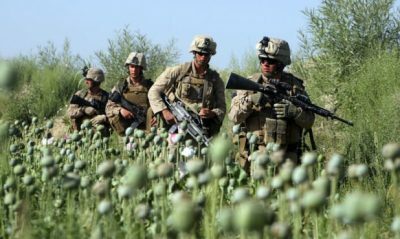 Immediately following the invasion (October 7, 2001) and the occupation of Afghanistan by US-NATO troops, the production of opium regained its historical levels. 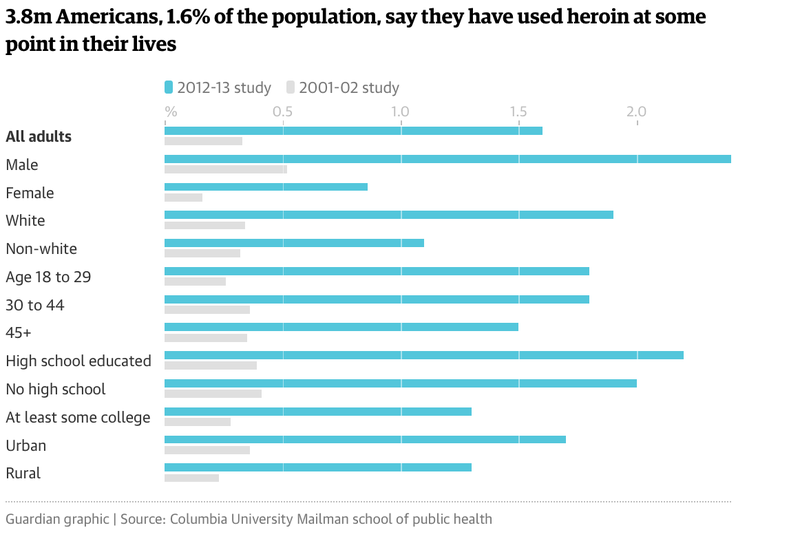 Since 2001, the use of heroin in the US has increased more than 20 times. Media reports rarely report how the dramatic increase in the global “supply of heroin” has contributed to “demand” at the retail level. There were 189,000 heroin users in the US in 2001, before the US-NATO invasion of Afghanistan. By 2012-13, there were 3.8 million heroin users in the US according to a study by Columbia University Mailman School of Public Health. 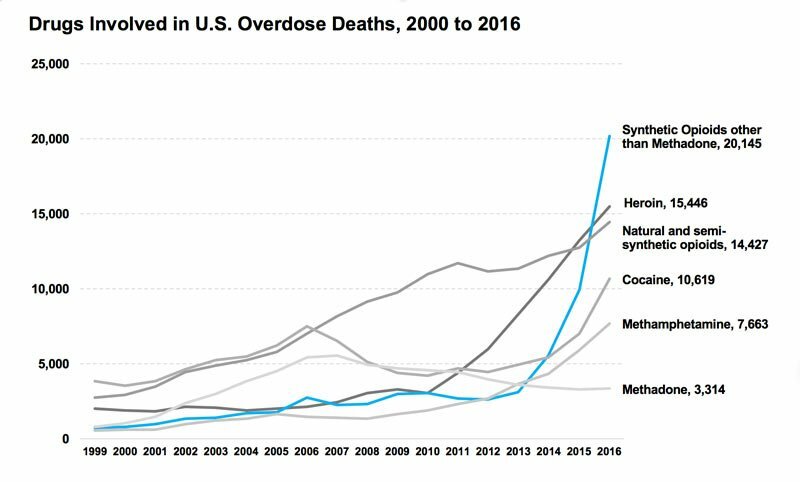 Extrapolating the 2012-2013 figures (see graph below), one can reasonably confirm that the number of heroin users today (including addicts and casual users) is well in excess of four million. “My Administration is committed to fighting the drug epidemic” says Donald Trump. Those lives would have been saved had the US and its NATO allies NOT invaded and occupied Afghanistan in 2001. The first thing they did was to undermine the drug eradication program, restore the opium economy and the drug trade. 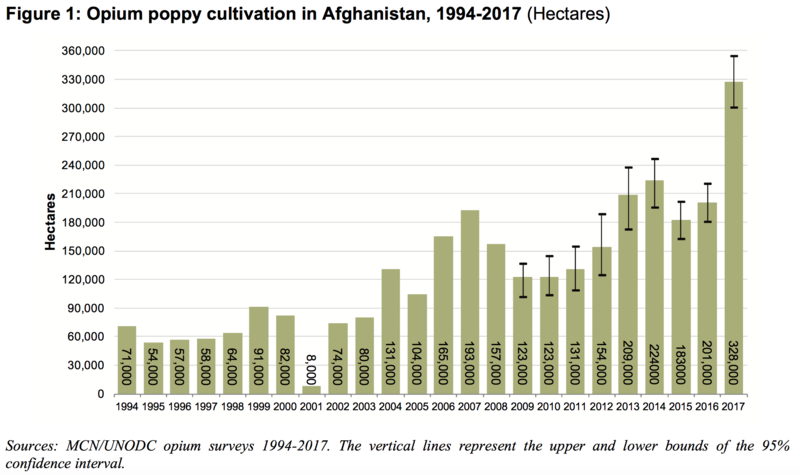 Opium production has increased 50 times in relation to 2001 (following the Afghan government’s drug eradication program). In 2001, the areas of opium cultivation had fallen to 8000 hectares (185 metric tons of opium). According to the UNODC, Afghanistan produces (2007) 93% of the illegal “non-pharmaceutical-grade opiates” namely heroin. The 2017 Afghanistan Opium Survey (released in May 2018) by UNODC confirms that the farm areas allocated to opium are of the order of 328,000 hectares with opium production in excess of 9,000 tons. War is good for business. It contributed to spearheading heroin use. The Afghan opium economy feeds into a lucrative trade in narcotics and money laundering. It is worth noting that in 2010 UNODC modified the concepts and figures on opium sales and heroin production, as outlined by the European Monitoring Centre for Drugs and Drug Addiction (EMCDDA). 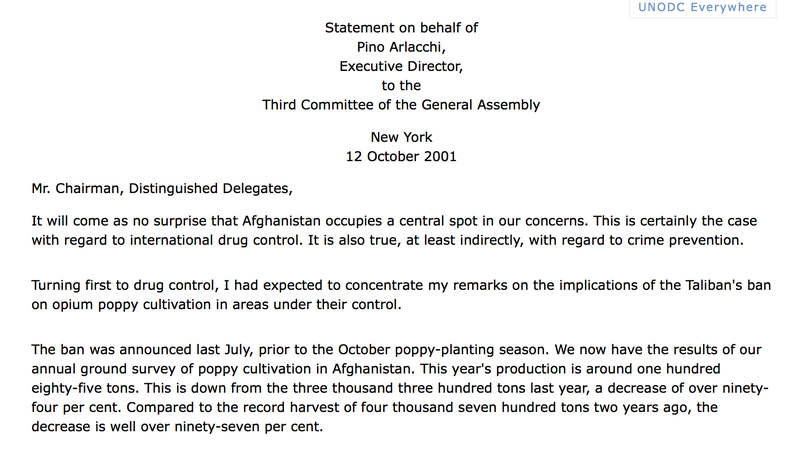 “UNODC estimates that a large proportion of the Afghan opium harvest is not processed into heroin or morphine” (UNODC, 2010a). …EU drug markets report: a strategic analysis, EMCDDA, Lisbon, January 2013 emphasis added. What this new methodology has done is to obfuscate the size and criminal nature of the Afghan drug trade, intimating –without evidence– that up to 20% of Afghan opium is no longer channeled towards the illegal heroin market. The profits are largely reaped at the level of the international wholesale and retail markets of heroin as well as in the process of money laundering in Western banking institutions, an issue which is not addressed by the Vienna based UNODC. The global monetary value of the heroin market (which is protected by powerful groups) is colossal. The retail price of heroin (sold by the gram) can vary dramatically from one country to another, it also depends on the percentage of pure heroin. This does not facilitate the process of estimating the monetary value of the global trade in heroin. Recorded retail street prices for heroin with a low level of purity must be converted to a dollar value which corresponds to pure heroin. 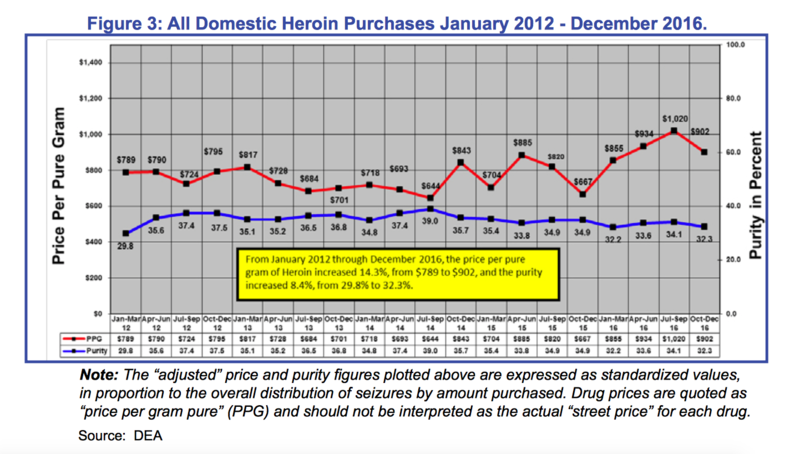 The estimated price per gram of pure heroin, however, is substantially higher. In December 2016, the heroin price per gram pure (PPG) was of the order of $902 in the US, according to DEA intelligence ie. $902,000 a kilo. GBP160,000 (25% purity) converts into GBP 640,000 per kilo for pure heroin, ie. approximately US$960,000 per kilo (December 2015 GBP USD exchange rate). According to the UNODC, 7600-7900 tons of opium were available for heroin production and export (out of a total of 9000-9300 metric tons). According to the UNODC, approximately half of the opium is processed into heroin within Afghanistan. The global monetary value for heroin can be roughly estimated using the US price equivalent PPG measurement for pure heroin of US 902,000 a kg. (December 2016, DEA) and the (lower) production figure of 790,000 kg of pure heroin (estimated by the UNODC). Using the US retail price equivalent of pure heroin (DEA), the global monetary value generated by the Afghan heroin trade (2017) is of the order of $712,580,000,000 (712.58 billion dollars), an amount equivalent to the US defense budget. This is a conservative estimate based on adopting the “lower figure” of 7900 metric tons (2017) (recommended by the UNODC methodology which is arbitrary and questionable, see above). If we had based the calculation on the total production of opium which is in excess of 9ooo metric tons (2017), the global monetary value of the heroin market would have been in excess of $800 billion. It should also be mentioned that this estimate relies solely on the the US price for pure heroin (DEA). Back in August 2018, President Trump signed the 2019 National Defense Authorization Act “which authorizes a top-line [defense] budget of $717 billion”, just a few million dollars in excess of the estimated global monetary value of the Afghan heroin market. The global monetary value of the heroin market is of the same order of magnitude as the defense budget of the USA. Needless to say, the Pentagon not to mention the CIA which launched the opium economy in Afghanistan in the late 1970s are intent upon protecting this multibillion dollar industry. The proceeds of the Afghan drug trade were initially used to finance the recruitment of Al Qaeda Mujahideen mercenaries to fight in the Soviet-Afghan war.